The church Wright designed for the Annunciation Greek Orthodox Congregation was among the architect's last major commissions. In 1956 Wright showed the original drawings for the new suburban church to the Milwaukee congregation, one of the ten oldest in the country. He died in 1959 before the ground breaking and the dedication of the church in 1961. 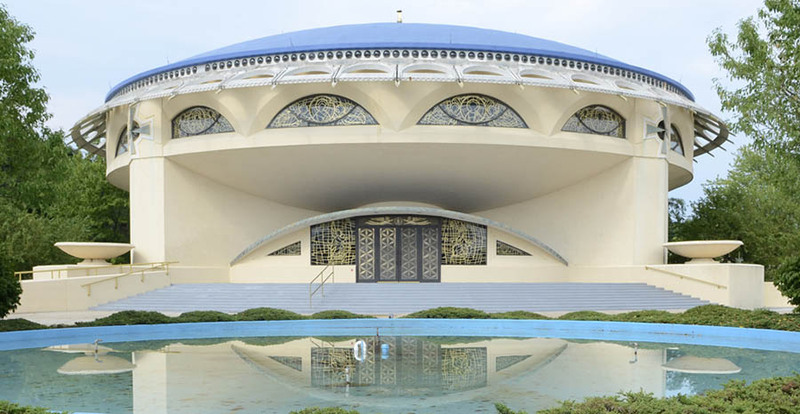 Wright's circular design represented a radical departure from traditional Byzantine church architecture, yet it retained the concept of a domed space and incorporated symbols and colors associated with the Greek Orthodox faith. The basic design of the church is based on the Greek cross inscribed with a circle. This characteristic motif is repeated in several decorative features which include the gold anodized aluminum icon screen, and the gates to the exterior sunken garden. Tours are generally not available. Tours for 15 or more by appointment only. Visitors are welcome to attend the Divine Liturgy on Sundays at 9:30 am.